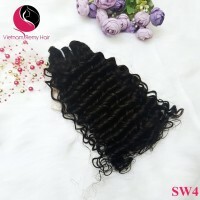 DOUBLE WAVY WEAVE HAIR	There are 22 products. Natural Vietnamese hair cheap price, high quality human hair extensions with wavy weave hair products. Double wavy weave hair does not have short hair inside each bundle, full hair end, natural color and beautiful wavy folds. You can use these double thick wavy hair products to make wigs or extension directly with short to long wavy weave hairstyles. Its life will be 1-2 years if you know to take care it as it is natural hair weave.